Although there weren’t many camp battles to determine this Spring, the Cubs’ ever-changing lineup and starting rotation full of big names left a bit of mystery around whom would be on the lineup card this Thursday in Texas. Fortunately, we just got a little peak behind the curtain. Maddon: Yu Darvish is lined up for the 2nd game in Texas (Sat) if there are no setbacks with the blister between now and then. We already know Jon Lester is getting the nod on Opening Day, not much surprise there, but we can now tentatively pencil in Yu Darvish behind him (fingers crossed on that “no set backs” bit). And with those two going first, I’d venture to guess that we’ll see Cole Hamels followed by Kyle Hendricks and Jose Quintana thereafter. This order accomplishes three things: (1) alternating lefties and righties, (2) getting the veterans up front, and (3) allowing both Darvish and Hamels to pitch in Texas once again. I wouldn’t be surprised, however, to see Quintana and Hendricks flipped in the rotation, if only because it would give Hendricks the ball at the Cubs home opener against Pittsburgh on April 8th. These are all fairly superficial reasons to go in this order – matchups are a far better reason to order your lineup one way or another – but since it’s just the first time through and will almost certainly get mucked up by off-days, injuries, etc. along the way, they’re as good of reasons as any. Maddon is waiting to sort through lineups for the Texas series. Could see Zobrist at DH, especially vs. LHP. That would potentially pave way for Bote to start at 2B. But, Maddon noted that Bote could go to 3B with Bryant in LF, too. You can pencil in Willson Contreras behind the plate, Anthony Rizzo, and Javy Baez at shortstop to start that first game in Texas, but beyond that things could move around quite a bit thanks to the DH. 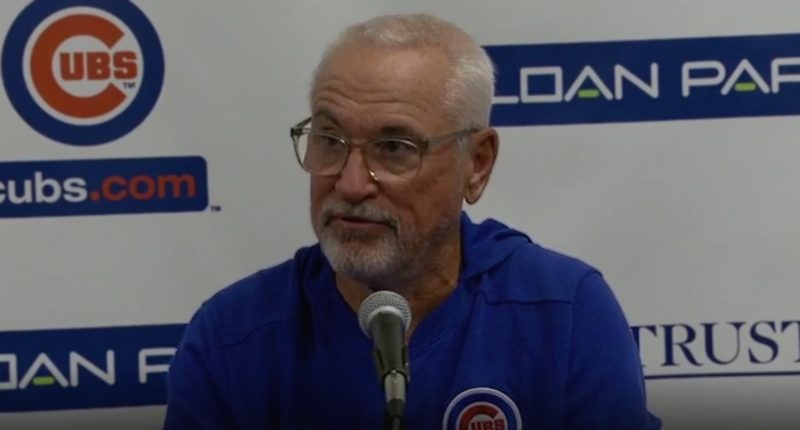 According to Bastian, we might see Ben Zobrist, not Kyle Schwarber, take on that role on Opening Day, when the Cubs will face left-hander Mike Minor, but it’s not clear if Kyle Schwarber will still be in left or if Maddon will decide to bump Kris Bryant to the outfield for that one and plant Schwarber on the bench. I’m sure they’ll want to maximize the best matchups, but it’s not like Schwarber is going to be in a strict platoon right out of the gate (at least, I don’t think he should be). Obviously, given the nature of the roster, this could be massaged a million different ways – and continued health will play a role – but at least we know a little more than we did a half-hour ago. Next Post Next post:Grab a Free Trial of ESPN+, Watch the Cubs Tonight, and Support Bleacher Nation!